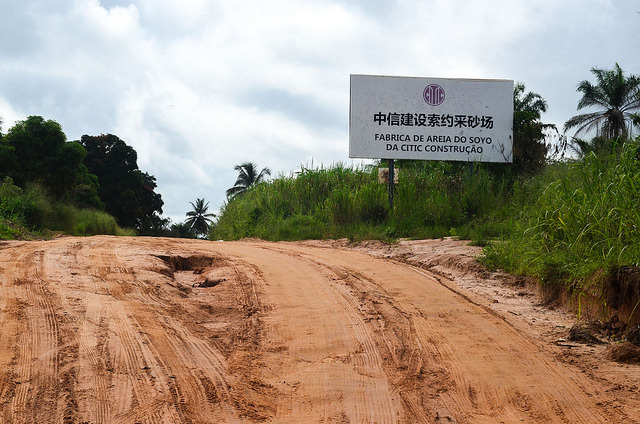 A Chinese construction sign in Angola near Kavugi Kifunta. Photo courtesy of jbdodane via Flickr Commons. Chinese engagement in Africa is highly varied, politicized, and wrought with pessimism regarding China’s intentions and its impact. 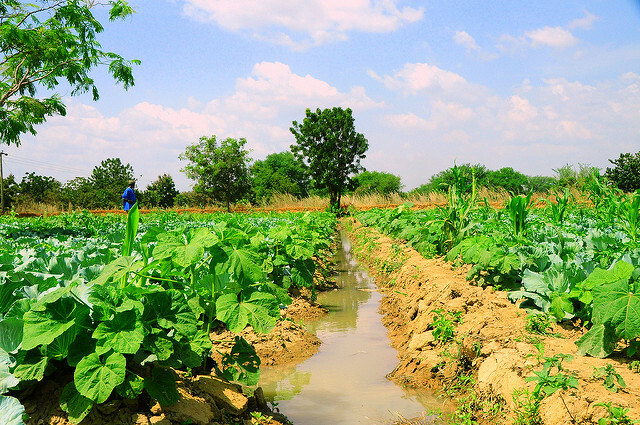 In this blog post, I plan to discuss some misperceptions about China’s relationship with Africa, address some of the challenges that African nations will face as Chinese investment grows, and speak to the potential opportunities for greater cooperation and better development on a large scale. 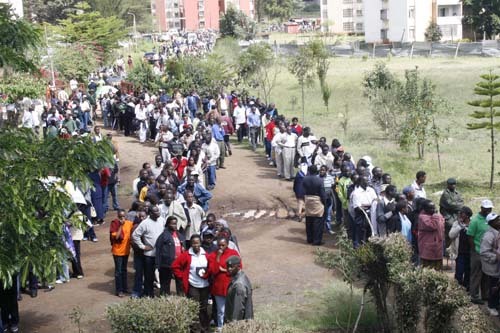 Voters queuing at a polling station in Kenya during the 2007 elections. Photo courtesy of User DEMOSH via Flickr Commons. Political tensions are high in Kenya with just a few days to the general elections. The European Union has warned that the country could once again plunge into violence, and the Kenya Elections Observation Group (ELOG) expressed dissatisfaction with the preparedness of the Independent Electoral and Boundaries Commission (IEBC). Opinion polls suggest that the election will be a two-horse race between the incumbent, President Uhuru Kenyatta, and the opposition leader, Raila Odinga. In attempts to woo voters, both candidates are targeting the youth vote—the largest voting bloc in Kenya. The candidates are very active on new media platforms popularly used by the youth: Facebook, Whatsapp, YouTube, and Twitter. 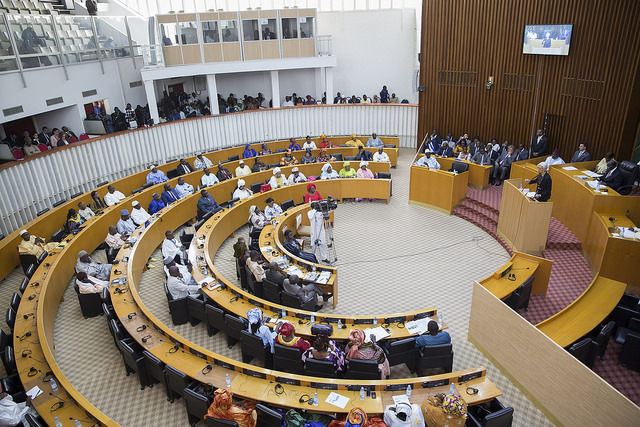 The National Assembly in Dakar. 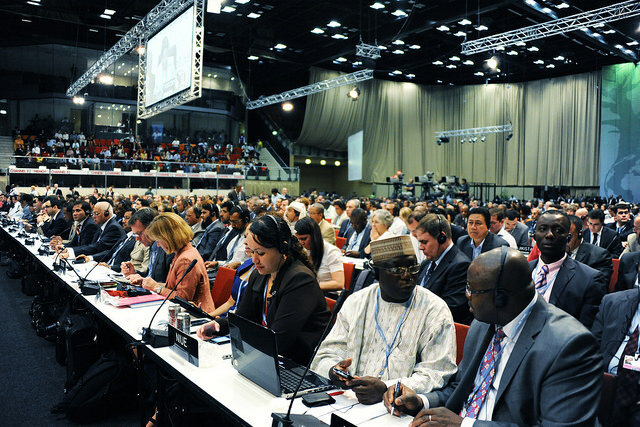 Senegal’s government has a long history of international engagement, including with the ICC. IMF Staff Photograph/Stephen Jaffe, via Flickr. Creative Commons. In October 2016, Burundi announced its decision to withdraw from the International Criminal Court (ICC), followed swiftly by South Africa and the Gambia (though the Gambia’s new president has reversed that decision). The idea of African countries withdrawing from the ICC has been floated since 2013, when Kenya’s parliament voted in favor of the country’s withdrawal in response to a warrant levied against President Uhuru Kenyatta, though Kenya has not yet taken further steps. These three withdrawals provoked fear of a coming “mass African exodus” from the ICC, fears that may have now materialized in a recent announcement of mass intent to withdraw at the January 2017 African Union (AU) summit. A Nigerian soldier with UNAMID, in Darfur. Photo by Stuart Price / UN Photo, via Flickr. Creative Commons. The United Nations has long enjoyed legitimacy as the international arbiter on issues of war and peace. A UN mandate signals international support for military action to maintain or restore peace. “Blue Helmets” are usually welcomed as guarantors of peace. 2016 was a difficult year for UN peace missions in Africa. High-profile missions in the Central African Republic, South Sudan, the Democratic Republic of Congo, and Mali are at high risk of failure. Even in Darfur, which has been off the front page, violence and suffering continues. 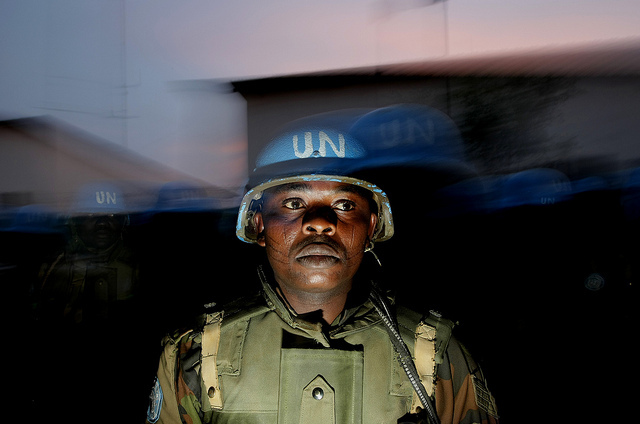 The legitimacy of UN peace missions in Africa is now in question because of dramatic failures to protect civilians and widespread sexual exploitation and abuse by peacekeepers. What Lessons Should We Take Away From The Gambia? 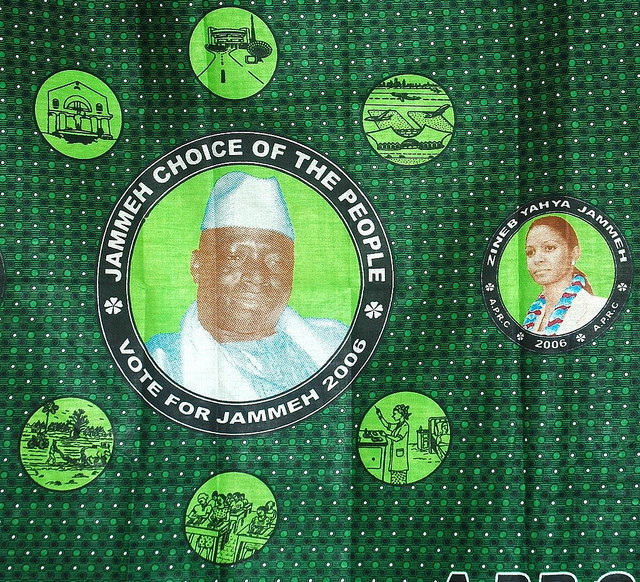 Commemorative cloth from Yahya Jammeh’s 2006 election campaign. Photo by Tommy Miles, via Flickr. Creative Commons. Africa and the international community heaved a sigh of relief as Yahya Jammeh, the former President of the Gambia, finally agreed to step down on January 20, 2017. This decision came after months of denying the results of the December 1, 2016 elections in which the coalition opposition candidate, Adama Barrow, a successful property developer, football enthusiast, and longtime resident in the UK, won a plurality of the vote. Jammeh, who had come to power in a military coup and ruled the Gambia with an iron hand for 22 years, brooking no opposition or challenge, had once declared he would be president for “a billion years.” His refusal to accept the election results had been challenged across the board by the newly elected Gambian president, the regional grouping of states called the Economic Community of West African States (ECOWAS), the African Union (AU), the United Nations (UN), and key international powers like the United States. His decision to step down brings the immediate crisis to an end, but the Gambia still faces significant challenges in establishing public trust in government and moving forward with development. The success of ECOWAS in forcing Jammeh to step down stands as an example of how Africa can independently handle its security challenges. 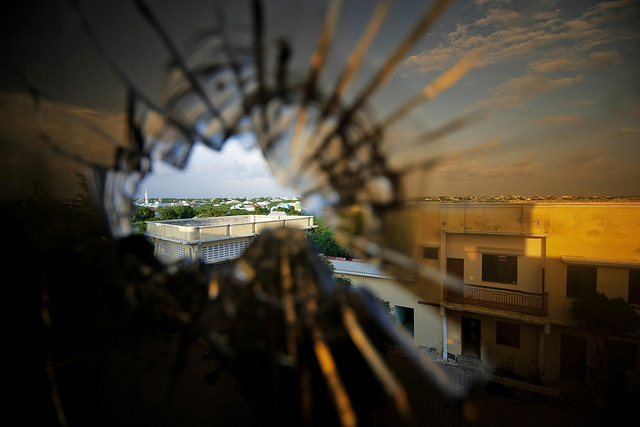 LIGHT AHEAD: A view out of the window of a Mogadishu hotel. UN Photo/Stuart Price, via Flickr. Creative Commons. Somalia’s experience in 2016 highlighted both the opportunities and vulnerabilities at the heart of the country’s ongoing political transition. With the postponement of parliamentary and presidential elections and the inability of the Federal Government of Somalia (FGS) to complete many of the core tasks outlined in its “Vision 2016” political roadmap, the year saw a tempering in the domestic and international optimism that characterized the formative years of the FGS under President Hassan Sheikh Mohamud (est. 2012). Meanwhile, al-Shabaab’s resilience and resurgence has heightened security concerns, compounding the uncertainty of what 2017 holds for Somalia. The country remains entangled in a web of political hostility and violent conflict, with significant implications not only for Somalia, but also for the region and larger international community. Boko Haram: Cash Cow of the Sahel, or Part of a Grand Strategy? 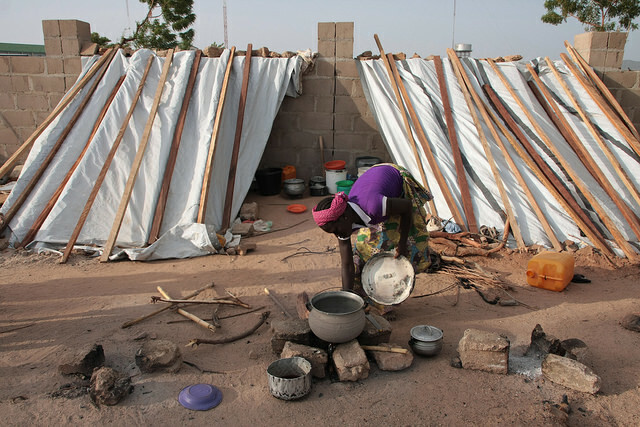 Many thousands remain displaced by Boko Haram. Photo by EU/ECHO/Isabel Coello, via Flickr. Creative Commons. Between 2002 and 2011, the BBC and the Guardian consistently rated Nigerians as the world’s happiest people. In sharp contrast, by 2013 a Forbes Magazine survey ranked Nigeria as the 20th saddest place to live on earth and the country ranked 123rd on the Legatum Prosperity index. This paper does not attempt to make an analysis of where it all went wrong, as such an endeavour would constitute a voluminous series. However one major factor responsible for this negative attitude transformation is the rise in militancy in the south and terrorism in the north of the country, the havoc wreaked in terms of lives and property, and the growing insecurity. The most notable among these groups is Boko Haram, an Islamist terrorist group that has plagued the north-east of the country and captured international media attention. This article contends that Boko Haram’s stature as Nigeria’s chief security menace was sustained by certain members of Nigeria’s elite, since it had become a cash cow for them. 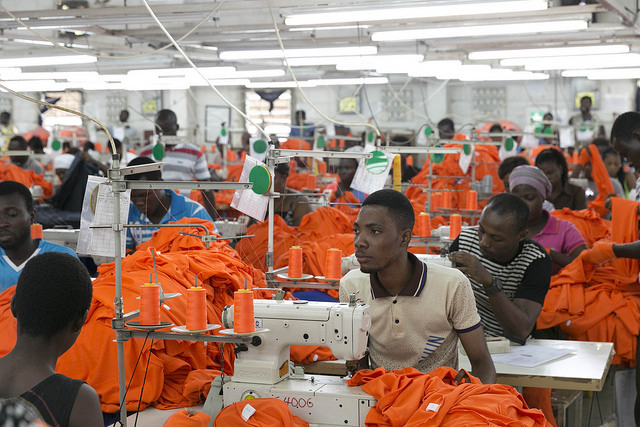 Garment workers at a factory in Ghana. The Third-Country Fabric Provision in AGOA has boosted African apparel makers. Photo by U.S. Embassy Ghana, via Flickr. Creative Commons. It has been one year since the African Growth and Opportunity Act (AGOA) was renewed by the U.S. Congress and signed into law by the Honorable President Barack Obama. The extension of AGOA through September 2025 provides certainty and predictability to the U.S.-Africa economic relationship and conveys a strong signal of confidence to the U.S. business community and African partners.